Credit: Kontaxis, Keromytis and Portokalidis. Every day, millions of users upload content on social media media platforms, including text, pictures and videos. While the creators of this content typically retain intellectual property (IP) rights once it is shared online, they often grant services hosting the content a broad license to use it, possibly in undesirable ways. For example, Facebook claims a transferable, sub-licensable and royalty-free license on all user-provided content, which is applicable worldwide. This particularly affects photographers and other creative professionals whose work is shared online, taking away their right to decide where it will be featured. Researchers at Columbia University, Georgia Institute of Technology and Stevens Institute of Technology have devised a new method to safeguard intellectual property (IP) rights of content uploaded online. Their approach was recently presented in a paper pre-published on arXiv. "Our research was motivated by the fact that users frequently need to agree to terms of service (TOS), which grant excessive rights to services, before being able to share pictures through them,"
Georgios Portokalidis, one of the researchers who carried out the study, told Tech Xplore, "Our goal was to investigate new techniques that would allow users to share their photos through such services, while actually hosting their pictures in services with more favorable terms or on their own servers." 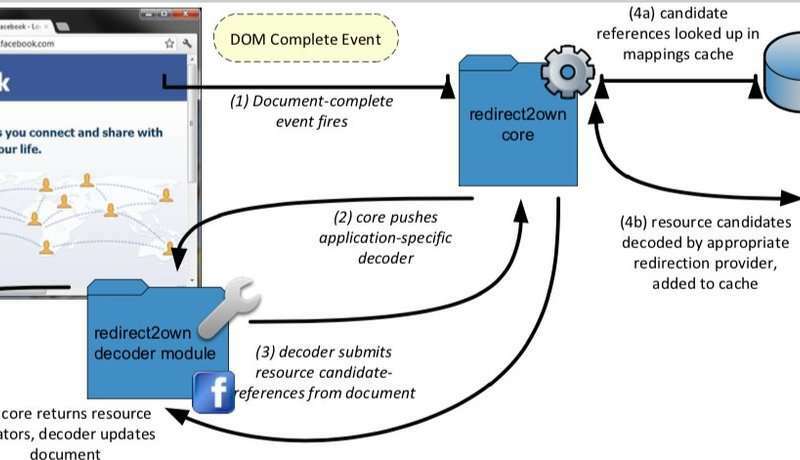 The approach proposed by Portokalidis and his colleagues builds on technologies such as QR codes, which can effectively encode information in images, as well as browser extensions that can transparently modify website content. Essentially, their design works by decoupling user data from social networking services, without incurring any loss of functionality to the user. "Our approach is based on uploading QR codes instead of the original pictures on the social networking services," Portokalidis said. "These QR codes contain the encoded location of the actual picture. 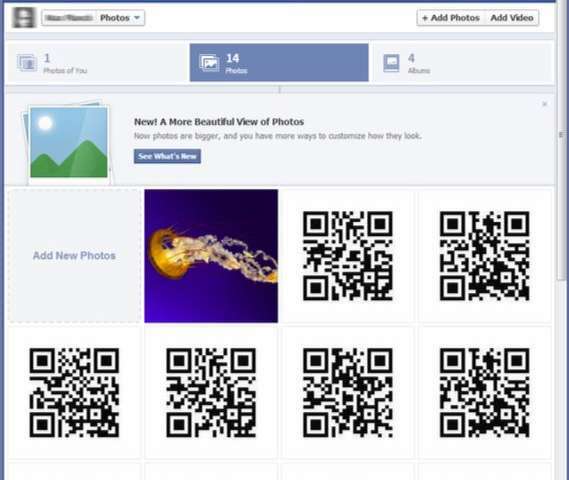 A browser extension transparently identifies these QR codes and replaces them with the original picture, as users browse them on social networking sites. The same extension can be used to transparently intercept uploads to a service (e.g., Facebook), uploading the pictures instead to a more favorable second service (e.g., Flickr). The first service gets QR code images instead." In other words, this approach keeps user data and content off social networking platforms, for instance in third party sites or servers that host user-generated content with more favorable terms of service. Concurrently, however, indirection schemata are seamlessly integrated into the social media services, without requiring cooperation from the server. This allows users to access their off-site content easily, just as they would if it was hosted on the platform itself. 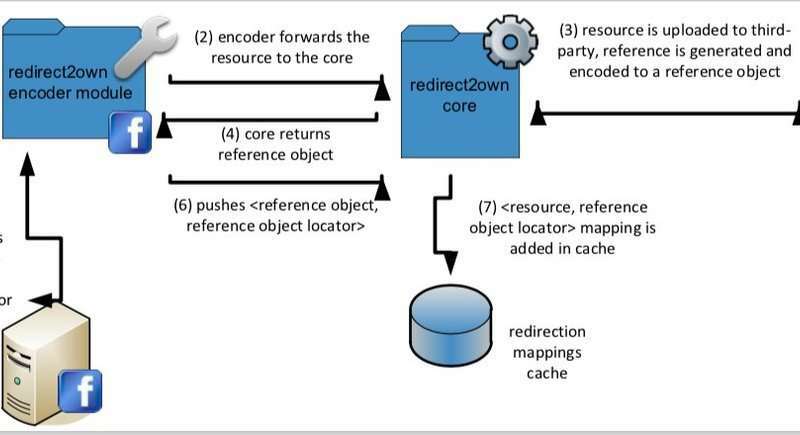 The researchers have applied this design to an extension for the Chrome web browser, called Redirect2Own. The code of this extension is open-source and its software can be downloaded for free. "Our study demonstrates that such a design, employing redirection, is feasible and incurs negligible overhead," Portokalidis said. IP in terms of artistic content at least, is a flawed concept because it is making something artificially valuable by restricting access to it. That applies on many levels: on corporations trying to deny access to information made by other people to extract a dollar from each viewing, and on the original authors trying to "multiply" their actual work and effort by charging multiple times for the same work in different forms duplicated by computers. Essentially, trying to uphold a "copy & paste" tax. 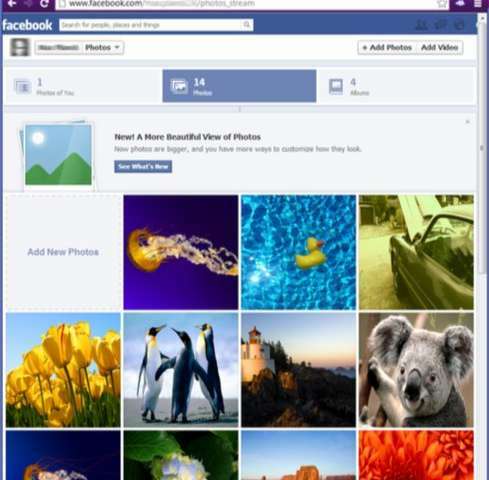 If you don't want Facebook to abuse a photo you made, don't upload the full original to Facebook. If you give it out for free, don't blame your audience for "stealing" it. Arguing that IP shouldn't exist is ridiculous. If I create something, I should be able to control when and where and how much I want to charge for that creation. Giving public entities the right to distribute content for free eliminates the incentive to produce it. Arguing that IP shouldn't exist is ridiculous. If I create something, I should be able to control when and where and how much I want to charge for that creation. Sure, but once you've sold it once or given it away for free, there's no actual reason why you should be granted any further control or money. Copyright is purely legal fiction. Giving public entities the right to distribute content for free eliminates the incentive to produce it. That's begging the question. Nobody's coming to take the fruits of your labor away from you - the issue about copyrights is simply about what happens after you've made it, sold it, and gotten the money once. The market for art, entertainment etc. has a finite size, and the people who make money by charging multiple times for the same work are simply competing for the same pool of money. Thus by them charging more, you actually get less stuff. The copyright incentive leads to lower output and generic art, not greater. After all, the point of copyright is that an author, or in practice a publisher, amasses a large enough portfolio of copyrights and then they never have to work again because the royalties off the work they've done in the past keeps coming in. That's why copyrights have been extended and expanded since the day it was invented. That is the "incentive" - it's also called rent-seeking. Since people are forced to spending their money paying the royalties and licensing for the old stuff, there's little money left over to fund new works and lesser known artists. All the money goes to a few highly advertised celebrity artists who make millions while their agents and publishers take the other 90%, and the rest are left with crumbs. -- Does this risk injection of malicious content/code/XSS, if the browser is in-lining it dynamically? -- How is this any different (from an IP perspective) from just using a URL? FB (and such) may inline the link's [image/video] content, but aren't granted any special rights to it. For that matter, if I link to someone else's site/content (under their terms), it doesn't give the linking social media site a blanket license (because I don't own the content or authority to grant it). -- Who will be paying for the site that hosts the real content? If someone is relying on "free" social media services for hosting then would they pay for and manage their own? If using another "free" service to host the content separately, what are their blanket license requirements? Isn't that just pushing the issue to another service? -- What stops the site from expanding the QR code directly? FB translates Youtube links to embedded videos.